Herbaceous and nutty from the start, this one start with a nose of your favorite kindergarten snack- peanut butter and celery. A low glow of citrus and herbs rides on a clean and juicy body. The citrus is joined by caramel and sweet onion throughout, while low tones of mulchy cocoa show through towards the end. The finish tapers quickly into herbaceous molasses. At Goshen Coffee Company, we think it’s important to contribute to our local community’s livelihood and our world’s sustainability. That’s why Goshen’s goal is to provide only flavorful coffee that we thoughtfully source and are excited to serve. You know. The good kind of coffee. The kind that knocks your socks off. Categories: Coffee Ratings. Origins: Nicaragua. Flavors: Caramel, Celery, Chocolate, Clean, Earthy, Green Herb, Herbaceous, Lemon, Light, Nutty, Short Finish, Slight Dry, Sweet Onion, and Vegetable. Brew Descriptors: Balanced, Citrus, and Juicy. 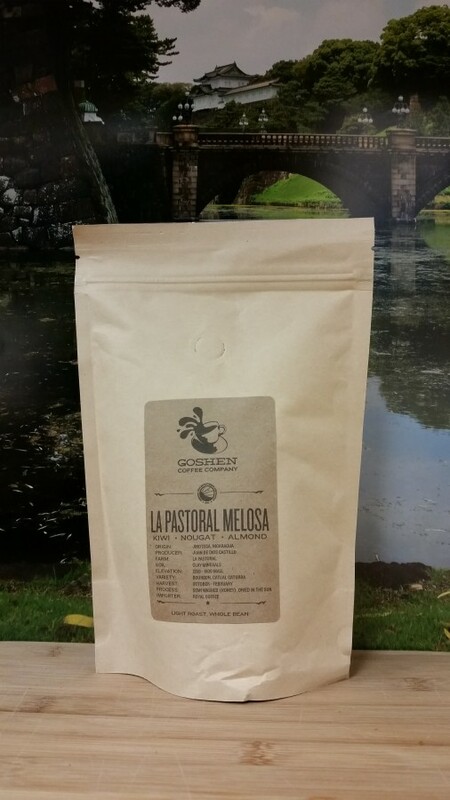 Roasters: Goshen Coffee.